It seems that everyone is “crowdsourcing” these days. Online polling, fundraising, and even news reporting are being achieved through the use of social media and the web. Anybody can post their thoughts, opinions, and ideas about anything and everything. The newest frontier in crowdsourcing is branding, by allowing anyone to use your brand in whatever way they see fit—but is this really a good idea? While crowdsourcing might be good for financing a new product or idea (think KickStarter), or gauging interest in a new invention (Quirky), it is questionable as to whether this technique is effective in branding. 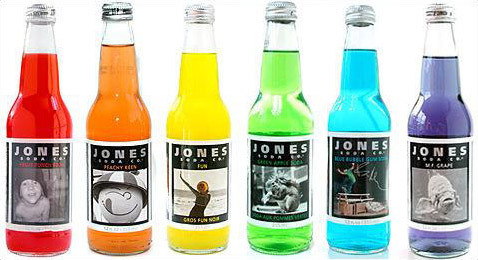 Some brands have been successfully doing this for years: Jones Soda Co. allows users to upload their own images and then uses them on actual bottle labels. In addition to uploading images, users can even customize and create their own soda’s flavor and label. 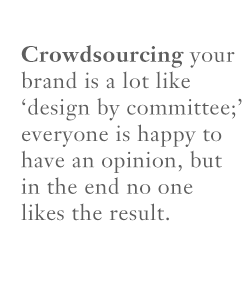 The reason that crowdsourcing has worked in this example is because it corresponds to the personality of the brand and the people who drink it: they are unique, quirky, and individualistic.